Philadelphia Police have now charged three teenagers in the beating death of a homeless man in Northeast Philadelphia last week. 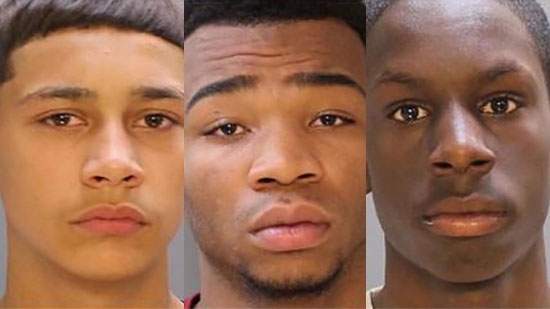 14-year-old Brandon Conrad, 16-year-old Malik Page and 17-year-old Emmanuel Harris have been charged as adults with murder, robbery, criminal conspiracy, and related offenses. It happened on Sunday evening, November 25th, on the 4200 block of Loring Street in Mayfair. Police were called to the scene of a robbery and discovered 57-year-old Kevin Cullen on the ground unconscious. He was taken to Aria-Torresdale Hospital and died the next day. Police believe that robbery was the motive. Philadelphia Common Pleas Court Judge Genece Brinkley denied Philadelphia hip hop star Meek Mill's lawyer's request for bail on Monday morning. Brinkley said that Mill, aka Robert Williams, was a "danger to the community" and a flight risk. Last week, the state Superior Court denied the defense's Writ of Habeus Corpus and directed the lower court to rule on bail "without further delay." Williams is currently in a state facility in Chester after being sentenced to 2-4 years following parole violations. The city's Health Department has confirmed that two Temple University students who died in the past week suffered fatal overdoses. 24-year-old Michael Paytas of Ridley Township, Delaware County was found unresponsive in Paley Library last Monday. He was taken to Hahnemann Hospital where he was pronounced dead. Paytas was a fourth-year marketing major. On Saturday morning, 20-year-old James Orlando of Reading was found in distress by his girlfriend in his off-campus apartment. By the time medics arrived he was unresponsive. There have not been five deaths involving Temple students since August.